DVD’s Now Available! Need your help sharing Video still! The DVD of our Video that is on YouTube is now available for Pre Order on our new STORE PAGE on the official web site of the song www.mynameisamerica.us! Go check it out. You can order copies of the CD, DVD or sheet music! We have had many folks order DVD’s to share at events and such. We also offer ways to buy in bulk if you would like to sell any of the products yourself. Email us at info@mynameisamerica.us for more info on that. The Video now has over 270, 000 views and counting! We still need your help sharing it. If you haven’t yet, you can forward this email to anyone you can! You can also copy and paste this link in another email if you would like: http://www.youtube.com/watch?v=6TPgJSZf5Vw. The more we can share the message, the better! PLEASE HELP US SHARE IT! We climbed to #4 on one, #10 on the other and #110 on the Big Main Music Row chart! Help us continue to get play by calling your radio stations! Tell them “My Name Is America” has over a quarter of a million YouTube Views, so they should be playing it! In our last Blog post we spoke about an Event we attended that Governor Rick Scott of Florida, also attended. 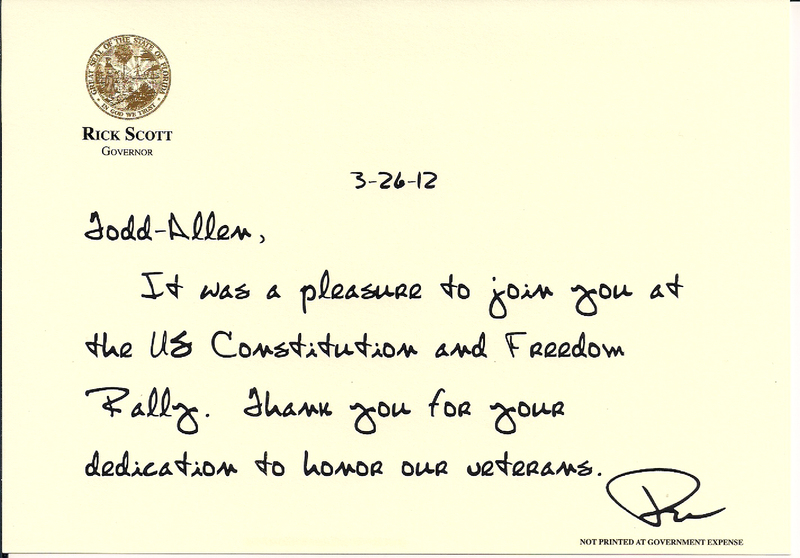 Below is a photo of the very nice letter we received from the Governor. It’s a pleasure to do the Right things in life. If you would like to read our past blog posts to understand the whole journey of the song so far- you can go to www.toddallenherendeen.wordpress.com. If you would like to follow Todd on Facebook you can visit www.facebook.com/toddallenherendeen. We appreciate each and every one of you and your support! We could NOT do it without you! You can find out what Todd Allen Herendeen is all about, his Tour Schedule and much more at www.toddallenherendeen.com. We have a Branson/Vegas style Family Show that is FOR HIRE! Visit his web site to see video and learn how to contact us about a booking today! He is quite the showman, and has entertained thousands all over the U.S. and Canada. Your theater, fair, festival or corporate event is looking for THIS SHOW! We look forward to making our show fit your event! This past weekend we had two incredible shows in Panama City Beach, FL and in North Port, FL! Gulf World Marine Park in Panama City Beach, FL is our Home Theatre that we perform at regularly. It is very nice being in a tourist area where the fans can come to you, so we don’t have to tour ALL year long! Thank you to North Port, FL for sucha fun show! While we were in town, Todd was able to do a radio interview on the bus. It will air over the internet This Saturday and Sunday April 7 and 8 at 6pm EST at www.watvnetwork.com. Click on the Play button that is an arrow > in the big square at the top right of the page. Thank you to Bill and Linda for coming to the show and doing the interview! We have some exciting things happening, hopefully including a NEW full length CD in the works, so keep all of us in your prayers! Thank you again for your love and support, you fans and friends are the reason we do what we do! Don’t forget to forward this email to friends! Go on do it now! 🙂 Thank you in advance! It’s HERE! The official “My Name is America” YouTube Video! Written by Kurt Orning, “My Name Is America” is a powerful patriotic anthem that speaks to the hearts of Americans. Proof of how well it is speaking is the fact that it has climbed to number 1 on the Indie World Country Chart. Though certainly a proud American song, other countries have seen tremendous response to it also and several stations have contacted Todd for interviews. As well as the Indie World Chart, “My Name is America” has broken into other charts as well, including the majors. If you hear it on your local radio station, plese call and tell them you liked it! For more information please visit http://www.MyNameIsAmerica.us and http://www.ToddAllenHerendeen.com. PLEASE If you want to help spread the incredible message in this song, SHARE THIS With all of your friends! We thank you and ask for your continued prayers. If you missed our last blog post , Click Here to check it out. THE OFFICIAL VIDEO- Turn it Up and Enjoy!